Un-assembled, frame assembly info included, but no weaving instructions and no weaving materials. 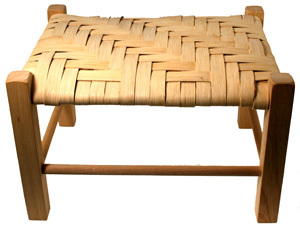 Weave it with your own choice of fiber: wide binding cane, seagrass, fiber rush, flat reed, Shaker tape. 12.5" long, 9.5" wide, 9.2" tall. Un-assembled, frame assembly info included, but no weaving instructions and no weaving materials. Weave it with your own choice of fiber: wide binding cane, seagrass, fiber rush, flat reed, Shaker tape. 12.5" long, 9.5" wide, 9.2" tall. Weaving material is NOT INCLUDED.